The world is moving to high definition. Shouldn't your live streaming be in HD too? 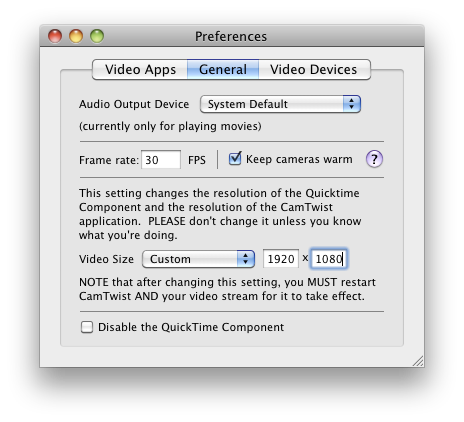 CamTwist not only supports standard resolutions such as 640×480 and 1280×720 but also gives you the choice to input whatever resolution you would like to work in. Want to produce content in 1080p? Simply enter in 1920×1080 in the custom resolutions preference and you’re all set! Not only can CamTwist produce shows in any resolution your system is able to handle, but it can also stream that live to the Internet as well. Using programs such as Wirecast or Flash Media Live Encoder you can dial in any SD or HD resolution you want to broadcast. The higher your resolution the more bandwidth and CPU power you’ll need so chose your settings carefully. Want to archive in HD but stream in SD? No problem! Using a program such as Wirecast or QuickTime Broadcaster you can archive in HD quality while streaming SD quality for maximum compatibility. Create a medium quality live stream that everyone can view and a high-quality on-demand version for iTunes, Miro or other. Anything is possible with CamTwist 2.0!